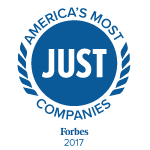 Zillow Group is pleased to announce that we have been named one of America’s Most JUST companies by Forbes and JUST Capital, a nonprofit that ranks the largest publicly traded corporations in the U.S. on issues Americans care about most. Companies selected for the list are recognized for outperforming their peers on criteria like worker pay and treatment, healthy products and communities, and job creation, among other characteristics. Equity & Belonging: We believe all people should live in a world where they are valued, supported, and belong – just the way they are. Embracing a diverse workforce, both in background and thought, not only enhances our workplace culture, but is key to our success. Pay Equity: We are committed to equal pay for equal work and experience, and invest significant resources to ensure women and men are paid equally. On average, women at Zillow Group earn $1.01 for every dollar a man makes in a comparable role with comparable experience. Work-Life Balance: Our commitment is to provide employees with a benefits program that is competitive and comprehensive with a primary focus on encouraging work-life balance by addressing all areas of an employee’s life – health, family, time off, growth, retirement, and community involvement. As Spencer said in the Forbes editorial, “…he is less interested in perks than in helping a wide array of workers, treating employees like adults and improving life beyond the office.” Ultimately, we tailor our benefits and perks to fit employees needs during the work day – not to keep them in the office. Interested in working for an award-winning company? We are hiring! Check out current job posting here.